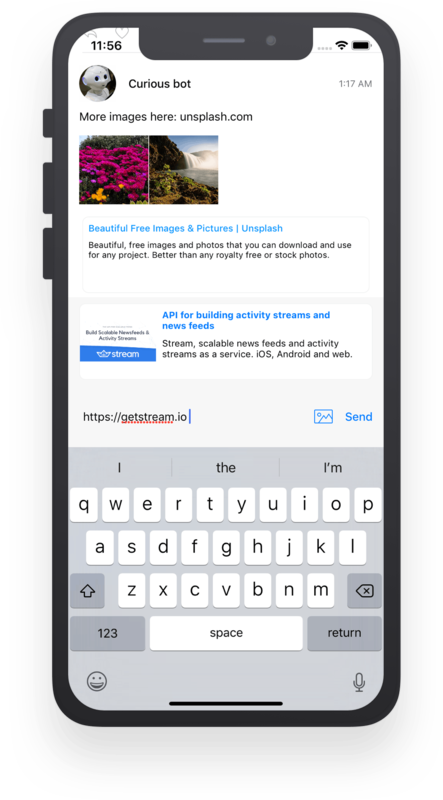 More information and resources on how you can use Stream APIs are available at the end of the tutorial. To get started, create a new Swift project in Xcode with a “Single View App” using the project name GetStreamActivityFeedDemo. Stream’s iOS Activity Feed Components are published on all major package repositories; so we’ll use CocoaPods as our dependency manager for this tutorial. Now that you are in your project directory and have ensured that CocoaPods is installed, let’s go ahead and initialize CocoaPods and install the Stream Activity Feed Components within our project. The above command will generate the GetStreamActivityFeedDemo.xcworkspace file automatically. With our workspace now containing our Pods project with dependencies, as well as our original project, let’s go ahead and move over to Xcode to complete the process. Once you’ve cleared the CocoaPods cache, it’s important to run the command pod install from within your directory to regenerate the cache. Your application is now configured with the API credentials for the demo application. Client.shared is a singleton we define in app delegate and re-use throughout the entire application. The shared client manages current user's session (token) and your Stream application API credentials (apiKey and appId). Because this is a tutorial, we do not have a real signup flow and we will use a pre-generated user session token, on a real-world application, your authentication backend would generate such token at log-in / signup and hand it over to the mobile app. Adding a timeline feed is very simple, the library comes with a built-in FlatFeedViewController class which loads the current user's timeline using the APIs and renders its content. Because we started this project as a “Single View App” we already have a ViewController in our project. 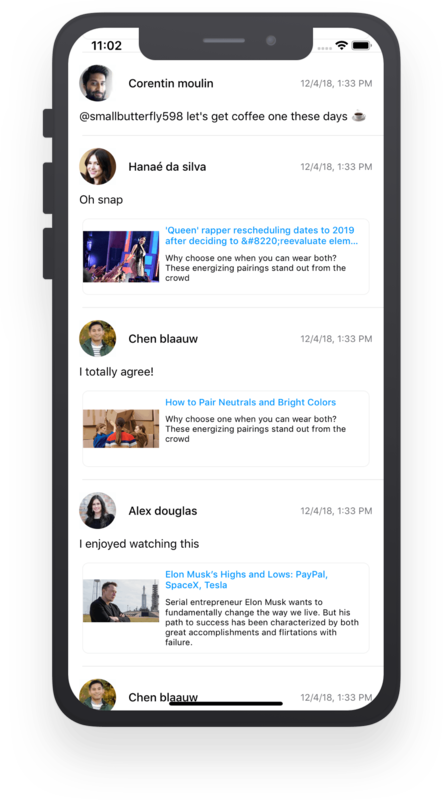 The example newsfeed is loaded with some demo data, this way you can see how different kind of activities are rendered out of the box. Our application is now showing the content of our user's timeline. To make this more interesting we have added some random example data. Note: real applications have more than just one view controller and often need more complex customizations. Under the hood the activity feed library allows you fine tune how feeds are used in your application. At the end of the tutorial you can find the link to our example application which shows how to use this library in a real world application. The Activity Feed Components provide functionality to add/remove reactions to the activities such as likes and comments. Adding likes to activities is very simple and supported out-of-the-box by the library. The only thing we need to do is change how we initialize the feed presenter class to show likes. Behind the scenes this adds an additional table view cell o display the Like button and the likes count. Comments are a very common functionality used on newsfeeds. 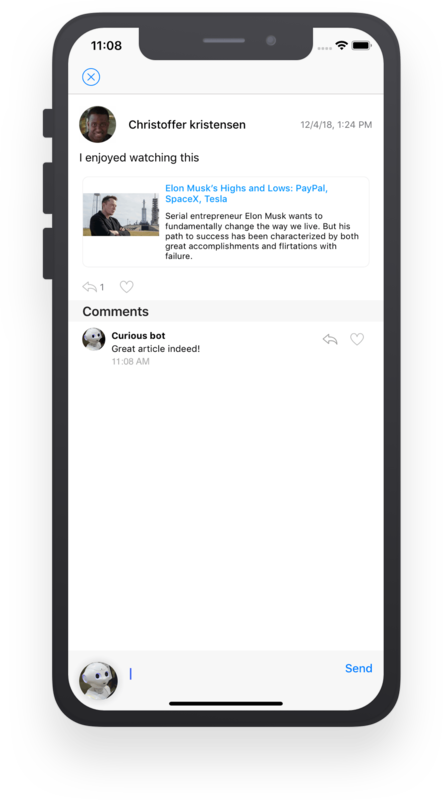 The library comes with built-in support for comments, let’s see how we can add comments along with each activity. For this we are going to add a detail screen for each activity. 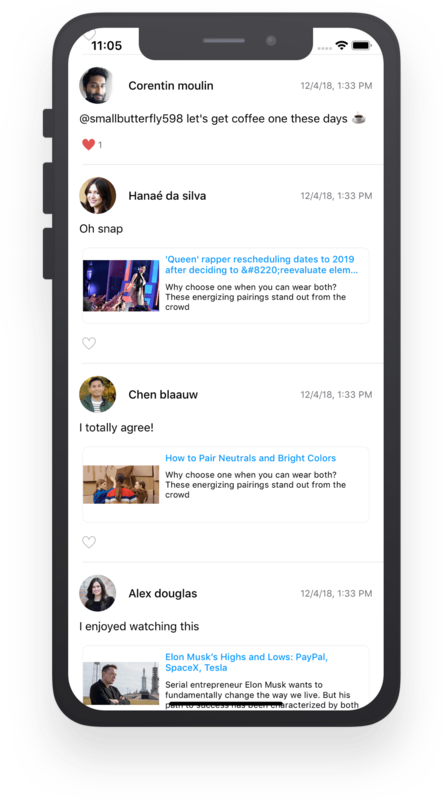 The detail screen will show the full activity information as well as the list of comments and a comment box to post new ones. Now that we have a working timeline with likes and comments, let’s add a status update screen to post content ourselves. Our timeline view comes with refresh control included; if you scroll down the timeline you will get the new activity loaded. print(result) // It will print the added activity or error. As a final touch, we are connecting the timeline to Stream's real time APIs so that we can show a message each time a new activity is added to the feed. To get FlatFeedViewController to listen for updates, we only need to call subscribeForUpdates(), that will create a Websocket connection to Stream APIs and subscribe for changes on the current feed. Our feed now will show a notification every time a new activity is added. You can see this in action if you add a new activity. So far we looked at how you can read and post activities using Swift. In most cases you will also need to perform server-side interactions such as creating follow relationships, adding activities or change user-data. All the functionality we looked at in this tutorial is exposed via Stream's REST API and can be used server-side. In this tutorial we saw how easy it is to use Stream API and the iOS Activity Feed library to add a fully featured timeline to a mobile application. Adding feeds to a mobile app can take weeks or months. Stream makes it easy and gives you the tools and the resources to improve user engagement within your app. Time to add a feed! Stream’s API is used by over 300 million end users. The API tutorial and the docs help you take a deep dive and learn how to fully customize your activity feed’s behaviour.